A press review copy of the module was provided. Find more Roll20 Reviews on my website and YouTube channel. 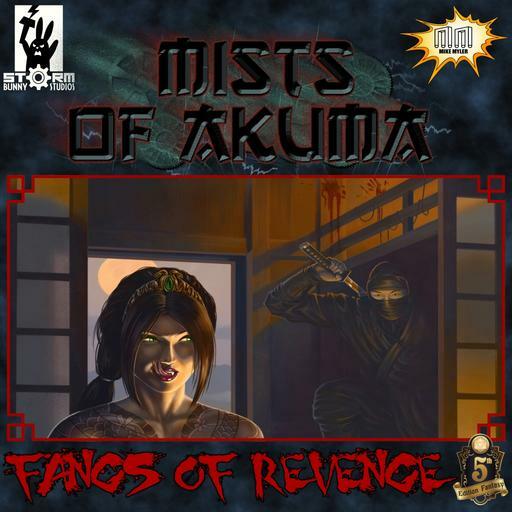 “Mists of Akuma: Fangs of Revenge” is relatively short adventure designed for a party of 4-6 PCs at level 6-7. It takes place within the city of Samon in the world of Mists of Akuma. I know nothing about this campaign setting outside of the scope of this adventure, but from what I can tell, it’s like a steampunk version of Teenage Mutant Ninja Turtles set in the Far East. The adventure includes an intimidating number of named NPCs as the PCs become embroiled in the middle of a city-wide rebellion, but the module suffers from poor map implantation, token errors, and an inconsistent art style.